According to the Centers for Disease Control, 80% of the population has moderate to severe gum disease, the major cause of tooth loss in adults, but fewer than 3% receive treatment. "Periodontal surgery is invasive," explains Dr. Gregg. "It's painful and scary, and not something patients readily accept. But the PerioLase® MVP-7™ and the LANAP® protocol makes treatment as easy as wiping chalk off a black board. 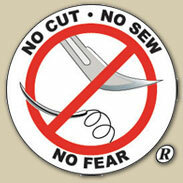 There is no cutting of flaps, any sutures, and minimal bleeding." The way to repair the damage is to get rid of the infection and close up the pockets. Until now, that meant surgery and sutures. But with the PerioLase® MVP-7™ and the LANAP® protocol, patients now have a faster, less invasive, virtually painless alternative. Because Dr. Gregg and Dr. McCarthy are the inventors of PerioLase® MVP-7™ and the LANAP® protocol, and teach their techniques to hundreds of other dentists across the country, they are eminently qualified to provide world-class periodontal services. Our laser is also very effective at eliminating the pain from sensitive teeth exposed to cold air, ice cream, cold water, or other elements.